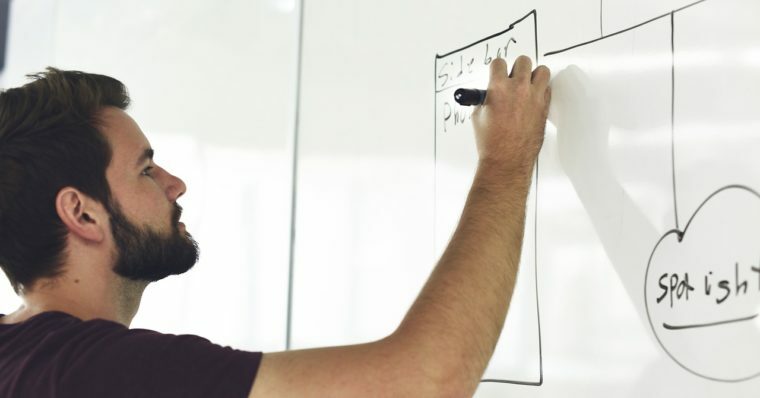 Content Upgrades is a fancy term Content Marketers use to describe “Bonus Content.” A content upgrade is simply additional content you offer at the end of your blog posts. This additional content can be anything from a bonus Checklist, a PDF version of the post or a template related to the content. To download or access this bonus content, readers need to subscribe to your email list. If you are already building an email list, I am sure you have probably heard the term Content Upgrades at least a thousand times. There is a reason why marketers obsess so much about creating the perfect content upgrades for their blog posts. Content Upgrades can help you literally double the size of your email list. Content Upgrades get a really high conversion rate which means more new subscribers every single day. The reason why content upgrades work is that they have a high perceived value in the eyes of your readers. When someone reaches the end of your blog post, it is safe to say they found it engaging and liked your content. This is the perfect time to ask them to subscribe to your email list. While you will get a few of your readers to subscribe when simply asking them to subscribe if you want the majority of your readers to subscribe, offer them a Content Upgrade. Creating a content upgrade is really easy and I will show you exactly how you can create your first in this guide. While the introduction of this post pretty much sums up what a Content Upgrade is, I want to take some time and explain what it really is. A Content Upgrade is simply downloadable bonus content you offer at the end of a blog post. Its purpose is to get the reader to subscribe to your email list. Content Upgrades are specific to the blog post you create them for. Offering a generic content upgrade doesn’t work. It has to “upgrade” the post it is a part of. The content upgrade in the above example accompanies the blog post it is a part of and “upgrades” the content of the post. This is a mistake even I am guilty of making. And every day I come across marketers and bloggers making this mistake on their blogs. If you make this mistake, nothing else in this guide matters. Creating a Content Upgrade that is not specific to your blog post. Think of this as a law. Violating this law will have consequences. Making your Content Upgrade specific is really easy yet most marketers don’t even try. They offer something that is related to their industry but is not specific to their blog post. If you want to nail it the first time, make sure your content upgrade is specific to the blog post you are creating it for. For example, if your blog post is “How To Lose Weight With Paleo Diet,” don’t offer a content upgrade on “How To Pick a Training Program.” While this Content Upgrade is specific to your industry, it’s not specific to your blog post. A Content Upgrade called “List of 50 Foods Allowed on Paleo Diet” or “5 Paleo Diet Mistakes Beginners Make” will perform much better. If you create a content upgrade for a blog post that rarely gets any traffic, you won’t see any noticeable difference in your list growth. 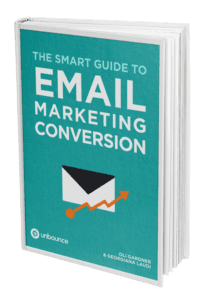 But if you create one for a high-performing blog post that gets some traffic (doesn’t have to be 1000 a day), you will gain a good amount of email subscribers every day. When creating your first content upgrade, create one for your highest performing blog post. It will give you the highest return on your investment of time and money creating the content upgrade. If you want your Content Upgrade to be perceived as high-quality, you need a great cover photo that goes along with it. Now, you don’t need a cover photo as good as the example above. Unbounce has a team (that includes a Graphic Designer) who created it. If you can’t hire a freelance graphic designer, create a cover that looks clean, simple and above all looks “good.” Not great, good. We will show you how to create one yourself later in this guide. Note: A Cover Photo only applies to PDF content upgrades. 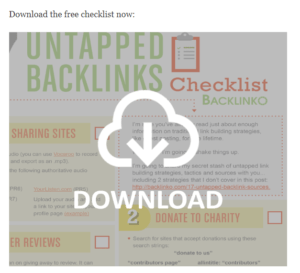 Don’t simply place a text link to download your Content Upgrade at the end of your blog post. Make it “shiny” and attention-grabbing. Do you see that? It is impossible not to notice this link to download the Content Upgrade once you reach the bottom of this post. There are a lot of things you can offer as a content upgrade to your subscribers. You might offer them a 10 page eBook that dives deeper in the topic of your blog post. 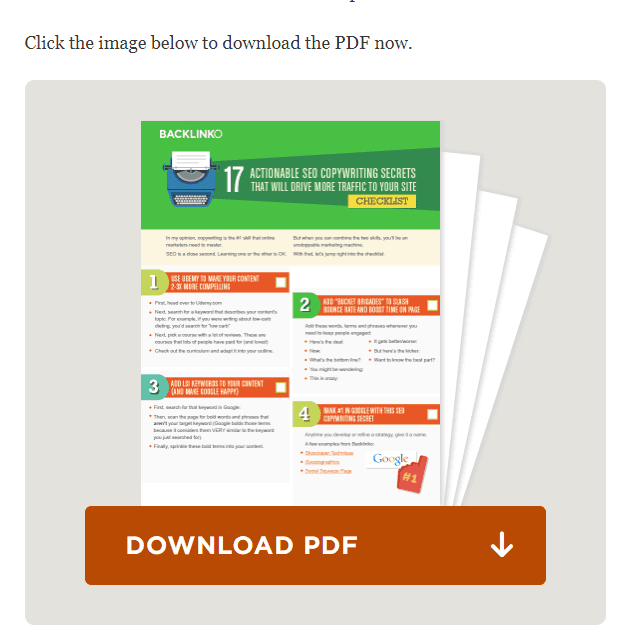 Or you might simply offer a downloadable PDF version of your blog post. When you offer additional content as a content upgrade, you induce what is called the Fear of Missing Out (FOMO). Let me explain this using an example. If your post is called “10 ways to lose 10 pounds of Weight” and your content upgrade is called “5 Additional Ways To Lose 5 More Pounds of Weight,” your readers won’t be able to help but subscribe and download your content upgrade. Why? Because they don’t want to miss out on the awesome additional tips you are offering. This one only works with list posts. If you have a list post called “10 Style Mistakes Most Women Make,” only offer 6 or 7 in the blog post and then bundle the remaining ones in a downloadable PDF. Once your readers finish reading the tips in your blog post, they will want to finish reading all the tips and will want to subscribe to download your content upgrade. Checklists make the life of your readers easier. 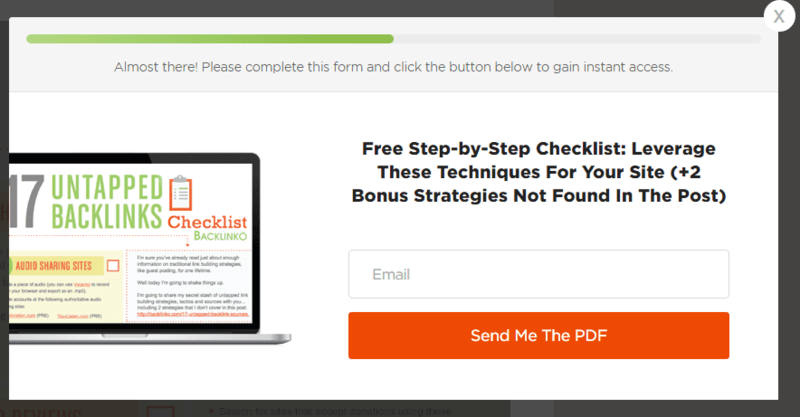 Offering a checklist is a great way to entice your readers to subscribe. If you have a blog post called “How To Prepare For a Half-Marathon,” you can offer your readers a simple PDF checklist version of this preparation guide. If your article helps your readers accomplish something, why not offer them a template and make their life easier. If your blog post offers advice on Goal Setting, why not give them a fill-in-the-blanks PDF Worksheet they can download and print. You can also offer digital templates such as a Spreadsheet that is related to your blog post. If you write a How-To article, you are most probably writing only about a part of a bigger process. For example, writing a blog post is just a part of Content Marketing. 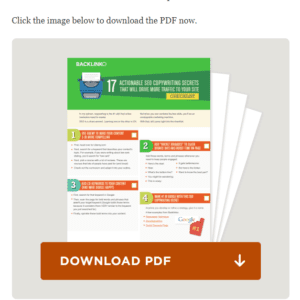 This isn’t the best content upgrade you can offer, however, if you don’t have any ideas for a good content upgrade for your blog post, offering a simple PDF Version of your blog post is enough. If you are not a designer, you probably don’t know how to use a complicated tool like Photoshop or Illustrator to create a PDF file. But you can still create a professional-looking PDF using Google Docs. Google Docs makes it really easy for you to create a PDF file. All you have to do is create a new Google Doc and write the contents of your Content Upgrade like you would for a blog post. Once you are done doing that, select File -> Download As -> PDF to download a PDF version of the Document. In most cases, your content upgrade will be a PDF file. When creating a PDF file (which we showed you how in the last section), you will want to create a book-like cover that goes with it. It will increase your content upgrade’s perceived value and help you get more subscribers. To create a Cover for your Content Upgrade, you don’t need to spend years learning Photoshop. You can use a free tool such as Canva to do it. Canva is a free tool that will help you create an awesome cover photo for your content upgrade even if you are not a designer. It will ask you to choose what type of image you want to create and will even offer you a simple fill-in-the-blanks template. Once you create the cover, add it to the top of your Google Doc. Now that you have a Content Upgrade, you will have to set it up so your subscribers can subscribe to your email list and download it. There are a ton of ways to do this but the easiest and the best way is to use click-triggered popup at the end of your post. Creating a popup like this is really easy. All you have to do is create an image with Canva and use our WordPress plugin to create the click-triggered popup. Creating a Content Upgrade for your blog can help you possibly more than double your Email List. But for that to happen, you have to create your first content upgrade. So instead of reading another article on “growing your email list,” grab your copy of our plugin, find your highest performing blog post and create a content upgrade for it. When creating a content upgrade, keep in mind that it needs to be something your audience wants. If you offer something they don’t want, no one will subscribe. If you have any questions, feedback or tips of your own, feel free to let us know in the comments below. Mohit Gangrade is a freelance writer and internet marketer. He writes about SEO and Content Marketing. We created a Facebook group to better serve the needs of our users. Pair users who need custom work with qualified developers. Get more in touch with our users to make better decisions for the future. What Does Email Marketing Have to Do with Brand Awareness? © 2017 · Popup Maker™ · a project by Daniel Iser & Friends. We hope you enjoyed this article, our authors worked hard to create it. If you have any questions or comments on the topic we would love to hear from you via our comment form below.